Captain Kevin Sneed of Rigged and Ready Charters is a light tackle inshore and offshore fishing specialists. We accommodate fisherman staying in the SOUTHPORT NC area. Captain Kevin Sneed offers charters from 3 hour to 14 hour Gulf Stream Fishing, Deep Sea Fishing, Offshore Fishing, Inshore Fishing and Backwater Fishing. Rigged and Ready Charters offers a 34′ Venture & a 31′ Competition are both powered by 600hp. Twin 300hp 4 Stroke Outboards. All boats loaded with bathrooms and the latest Garmin electronics, radar, safety gear, the finest tackle.including electric reels for bottom fishing-CHILDREN WELCOME on all our charters. If you are staying in the SOUTHPORT area you have come to the right place to book your charter. 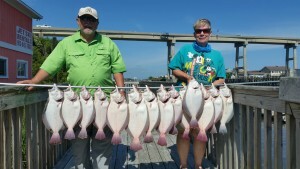 Visit our fishing reports page at riggedandreadycharters.com for the latest reports and pic. WE LOOK FORWARD TOO FISHING WITH YOU SOON OUT OF SOUTHPORT, NC.